View the Best Vegan Dog Treats on the Market, Below. What to look for when buying Vegan dog treats? Can a dog be Vegan? What are the best Vegan dog treats? What Vegan dog treats for big dogs? We all have to do what we can to keep ourselves healthy, as well as the planet we all share. It’s simply a responsibility we all have. 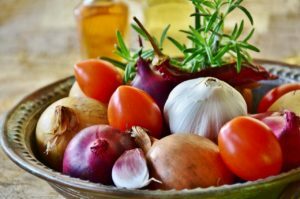 Many people believe that going vegan is one of the best solutions to do so, which science supports to a certain degree. But what about our pets? Surely they contribute a lot to the meat consumption that vegans try to avoid? Or would it actually be animal cruelty not to feed a natural carnivore meat? We have researched the best vegan dog treats on the market and managed to find a list of ten that are not only good for the planet but good for your dog as well. We’ll also answer the most common questions about vegan dog food, like if it’s possible for a dog to be vegan, and if it’s healthy for them. We can already reveal that the answer might not be what you think, and it’s not totally black or white. There are two camps when it comes to veganism, and even more so when it comes to pets that can’t really decide for themselves what they get to eat. We realize that this subject might seem controversial to some consumers, but bear with us, and you might be surprised when you’ve read about these vegan doggie training treats! Even our dog friends that eat meat can munch on these vegan treats as they’re just a supplement and not really a big part of their diet. Ready to explore some great vegan alternatives for your dog? Excited to find treats with such good ingredients that you could even try them yourself? Let’s take a look at the treats we’ve found! Vegan dog food is very popular among vegan pet owners, and KarmaPets stands firmly behind this. That’s why their treats are all 100% vegan friendly. Their latest product is the highly raved about calming treats for dogs. With a blend of natural and organic products that help soothe your pet’s anxiety, these are a real winner for dog owners worldwide. There is no need to invest in expensive meds anymore, since the bites themselves will help calm your pups anytime, anywhere. If your dog suffers anxiety from car rides, seeing the vets, separation from owners, destructive chewing (use a tough dog toy for aggressive chewers here), kennel anxiety, grooming stress, pacing and much more, then the KarmaPets calming treats might be for you. They are the ideal solution for pets that easily succumb to stress and anxiety on a daily basis. They come in a recyclable white jar with a resealable screw top lid, enabling you to prolong shelf life. You will be getting around 105 treats per jar, which is an ideal amount to last for enough time to notice a positive change in behavior. There is also no palm oil included within the recipe of these treats, as palm oil can be toxic to dogs. 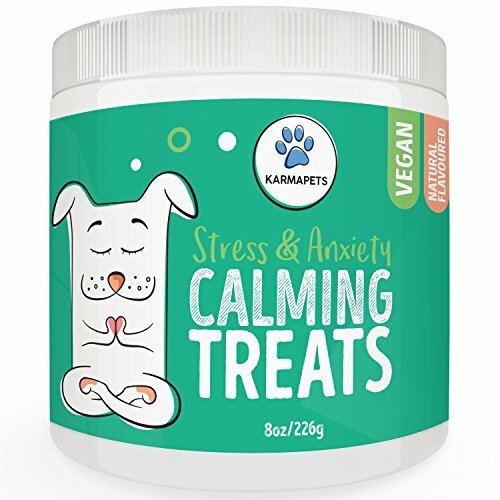 The KarmaPets team stand behind their mission to make the world a better place, and they do that through a reliable selection of their calming treats, like these! Let’s start with one of the vegan dog food brands that is very popular among vegan pet owners. 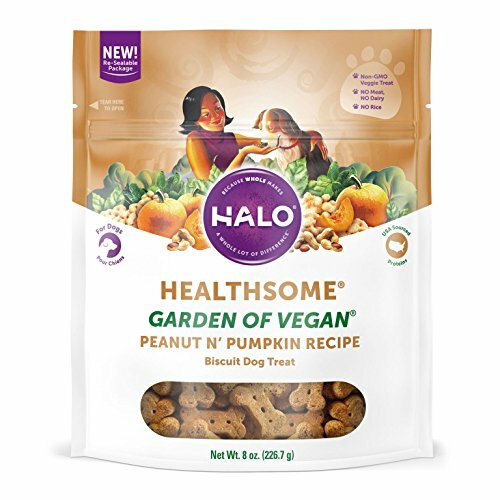 Halo make really good dog and cat food, and their vegan dog biscuits are peanut and pumpkin grain free, made from a blend of fruit and veg. Delicious for little doggies! These Natural and vegan crunchy dog treats are low-fat and gluten free, so they work well for most dogs. However it might be good to know that some dogs get a bit gassy if they have too many, so one or two per day seems to be best. After all, it’s a treat and not a meal. You wouldn’t feel good if you ate to much dessert either. The texture is really crunchy, exactly what dogs love, and they’re natural with no extra junk like artificial colors or flavors. One thing that we really like about these is that every time you buy a package, Halo donates full dog bowls to shelters, meaning that it’s not just your doggie that benefits from it, but also other less fortunate animals. This fits well in with the vegan lifestyle that is all about making conscious decisions and giving back to the planet we’re living on and the people and animals that share it with us. 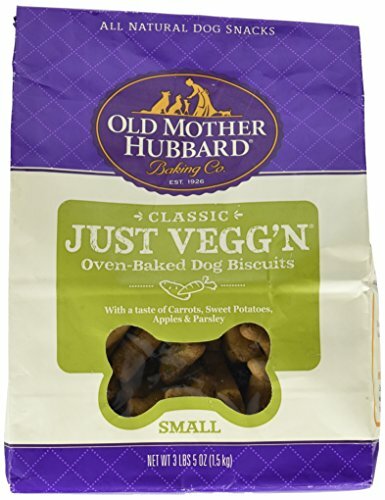 If you liked the idea of the first biscuits but would like treats that your dog can eat a bit more of, Old Mother Hubbard Crunchy Classic Natural Dog Treats will be able to help you out. She has baked really nice little vegan dog biscuits that taste of carrots, sweet potatoes, apples and parsley, and the dogs are going crazy for these! They’re natural with no weird additives. And they look really cute too, just like you expect old school dog biscuits to look! Old Mother Hubbard are not exactly new in the game, they’ve been making dog food biscuits since 1926, so they know exactly what they’re doing! 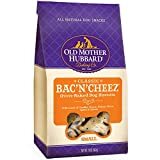 These Old Mother Hubbard Crunchy Classic Natural Dog Treats are great for older dog friends that can’t chew hard foods too, since they are easy to chew. One day, over 20 years ago, a guy called Patrick and his dog shared an energy bar when they were out on a hike. Zuke, as the dog was called, really liked it, and that got Patrick thinking. He realized that there should be similar snacks for dogs, healthy stuff to eat when they need a little pick-me-up. So he decided that this was a good business opportunity, and it payed off. Zuke’s SuperFood Blends come in two different versions, Tasty Greens or Yummy Berry. If you’re into superfood and love knowing exactly what you eat and how it’s good for you, chances are that you will want to give these to your dog. They’re packed with healthy stuff and they’re made without gluten, corn and soy. The treats come in resealable pouches so that they will keep fresh for longer. Let’s face it, even though you might not like meat, dogs are kind of loving it. So wouldn’t it be great to somehow imitate that meat flavor? 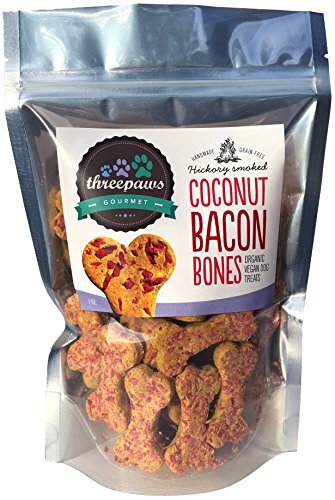 That’s exactly what these little Coconut Bacon Bones do, they have a hickory smoked flavor that really smells (and probably tastes) like bacon, making dogs go crazy of excitement! Organic coconut flour, certified organic garbanzo flour, organic coconut milk (tip: try using coconut oil for your dog), organic peanut butter, certified organic coconut flakes, organic beets, hickory smoke powder, turmeric powder. Notice that they’re completely free from grain, gluten, corn and soy. We had no idea that dogs like coconut, but if we are to believe the reviews for these little bones, they love the stuff! 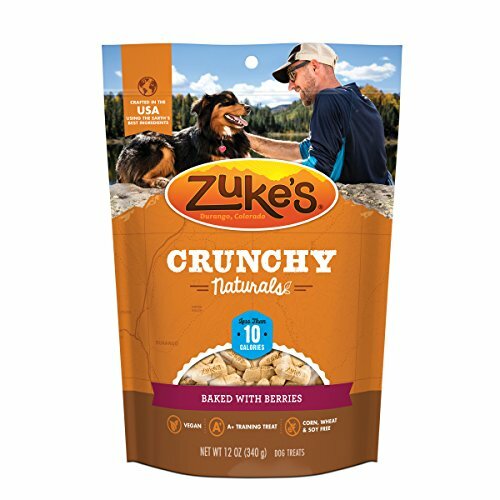 Remember Zuke, the dog that shared an energy bar with his master and all of a sudden got a dog food brand named after him? Apparently one day he said to Patrick: “Hey, can you please make treats that are made from peanut butter so I don’t have to steal kids sandwiches all the time?”. Ok, maybe that’s not exactly what happened, but we felt like it’s a good introduction for these treats. We had no idea that dogs like peanut butter, but apparently they really do! Who would have guessed? But they don’t only contain peanut butter, but also cherries and savory herbs that give them a lot of flavor. They’re less than 3 calories per treat, so they won’t make your dog fat unless you give it a lot of them. As long as it has deserved them you won’t have to worry, which is nice! Want to read the ingredients for these peanut butter dog treats, too? OK, here you go! Peanut butter, ground barley, ground rice, rolled oats, malted barley, vegetable glycerin, tapioca, cherries, gelatin, lecithin, salt, phosphoric acid, sorbic acid (preservative), turmeric, ascorbic acid (Vitamin C), Vitamin E supplement, zinc proteinate, citric acid (preservative), mixed tocopherols (preservative), rosemary extract. Notice that there’s no corn, wheat flour or soy in these peanut butter dog treats! Just good stuff for your doggie friend! 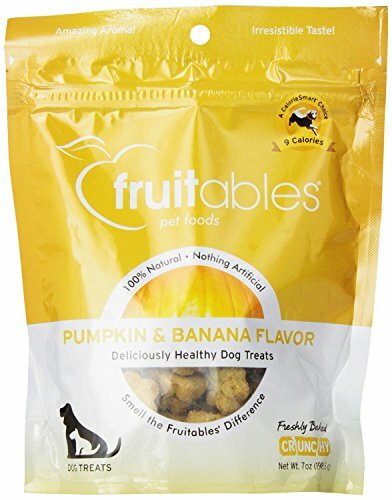 If you want to have plenty of flavors to choose between you should check out Fruitabels Natural and Vegan Crunchy Dog Treats. There are four delicious flavor combinations that are really fun. Choose between pumpkin and apple, pumpkin and banana, pumpkin and blueberry and pumpkin and cranberry. They have lots of flavor and are nicely crunchy. Even dog owners have been known to snack on them, they’re that good! They are natural dog treats with good ingredients and they come in a resealable pouch so that they stay fresh for longer. Each treat is under 9 calories, which is good. They use harvest fresh pumpkin to make them. This is the reason they are called fruitables, because pumpkins are actually fruit, even though most people would view them as vegetables. Do you get it? Fruit+vegetables=fruitables. These treats are free from corn, wheat, soy and artificial stuff that you don’t want your dog to eat unnecessarily. They’ve got plenty of nice antioxidants and fiber, making them perfect snacks for your dog. They recommend 4 treats per day for every 10 pounds your dog weighs. Next up are all-natural vegan doggie treats that are packed with nice healthy stuff like apple and hempseed, sweet potato and apple or peanut butter and banana. They’re free from nasty stuff like wheat, corn, soy, fillers and artificial flavors and preservatives, so you can give them to your dog without being worried about its health. The treats are grain free and made in the U.S.A, and Shaded Trails pride themselves in including only human grade ingredients, meaning that you could even eat these yourself if you feel like it! This also means that they’re good for you dog’s health, this food also improves dog’s skin allergies, coat and heart health, which is just great. The only thing you need to be aware of is that they’re 17 calories per treat, which is much more than many other treats, so make sure that you don’t give your dog the whole bag at once, even if it begs you! 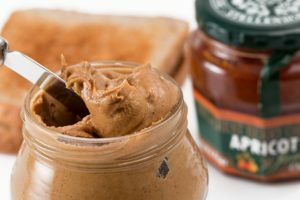 + Apple and hempseed, sweet potato and apple or peanut butter and banana. 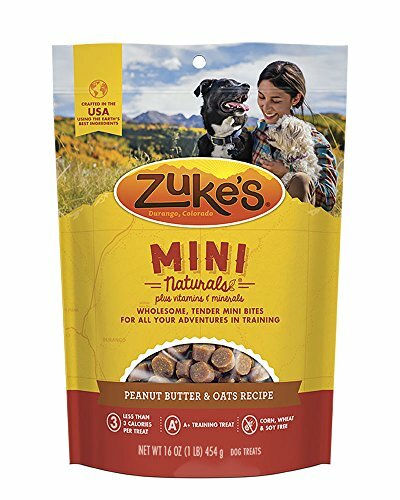 Sometimes when we’ve read reviews for other dog treats, they seem to be quite a lot about what the human thinks about them, like packaging or how affordable these dog foods are, but we noticed that the reviews for these treats are slightly different. They all witness about their furry friends who love these treats! And after all, that’s what really matters, isn’t it? The dog won’t care about the packing or how much money you spent, but he will care about the taste. 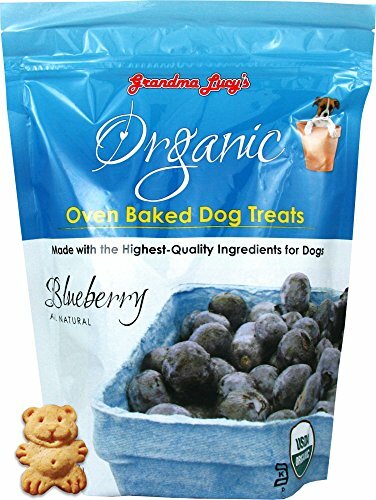 Grandma Lucy’s Organic Baked Dog Treats are organic and vegan dog friendly treats and come in three different flavors, apple, pumpkin and blueberry. One really nice thing about these vegan dog biscuits is their super cute shape in the form of teddy bears. Grandma Lucy’s Organic Baked Dog Treats contain no artificial colors, flavors or sweeteners and are organically certified. The ingredients are 100% vegan and the oatmeal vegan dog treats for your dog are made without corn, wheat or soy and they are under 10 calories per treat. They come in three different flavors: berries, peanut butter and bananas, and pumpkin and sweet potato. They are perfect for when you want to treat and reward your dog with something nourishing. + Like cookies for our furry friends! Be honest, what does your dog’s mouth smell like? Probably not the most wonderful smell, right? And never mind the breath, what about your dog’s teeth, how are they? Maybe it’s time to try out Breathbones? These doggie treats are made to help out with your dog’s dental health and stinky breath and contain natural ingredients like pumpkin and chia seeds. Alternatively, you can try using one of these dog toothpasates. As you can tell, most of it is just normal stuff that you can pronounce and maybe even know what it is, but then there’s the carrageenan- what is that? 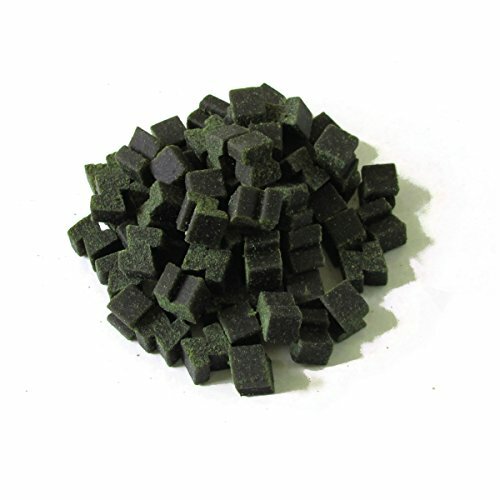 It’s a vegan alternative to gelatin that is natural and made from red edible seaweeds. The reason why we mention this is that some people seem to believe that carrageenan can cause cancer, however there doesn’t seem to be much research to back this up properly. But it might be good to know so that you don’t give your dog too many of these. I guess you have to choose- bad teeth for sure or possibly, maybe potentially cancer. 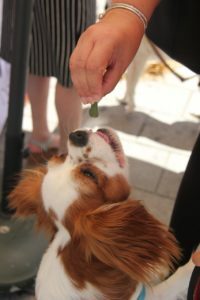 You can be certain about one thing, dogs love all the treats we’ve looked at! 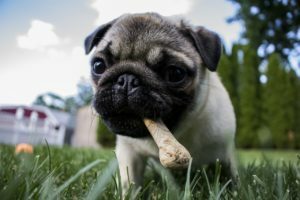 But even though you might have found a few new treats for your dog that you want to try out, or, let your dog try out, you might have a few questions about vegan dog treats. 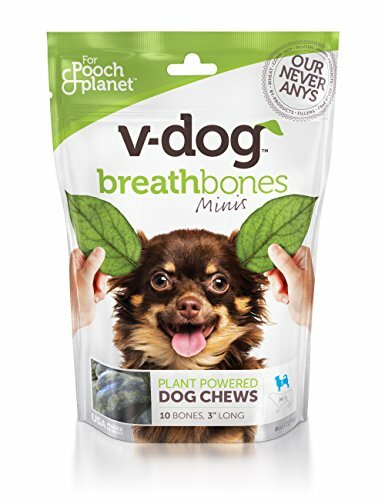 Are they good for your dog, yes, could a dog even eat a fully vegan diet, or is that bad for them? We’ve answered everything you need to know in order to make a good decision regarding your dog’s diet and we’ll also reveal what treats are our favorites among all the ones we’ve looked at. 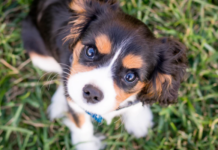 We really hope that this article has helped you to find treats that your dog is going to love! There is one really fun thing about vegan dog treats, and it is that you can actually taste them yourself! Most of the flavors available are berries and vegetables like pumpkin or sweet potato, but you’ll also find a few with peanut flavor and fruit like apples and bananas. Out of the ten treats on our list, there is only one that’s similar to meat in any way, using the smoky kind of flavor you normally associate with bacon. The question is if our four-legged friends know that they should think ‘bacon’ when they eat something smoky. They seem to really like them, but we’re not sure if it’s because the dogs think it tastes like meat. In order to give your dog the best treats, you’ll want to be able to read the ingredient list without finding weird stuff that you can’t pronounce. The rule is, if they have ingredients that you could have in your own pantry, then you know that they’re safe for your dog. A big plus is if the ingredients are organic. One thing that all the treats on our list have in common is that they’re all supportive of a healthy diet. They all contain ingredients that are full of vitamins and minerals, and most of them are low-calorie so that you don’t have to worry about your dog getting fat. But just like treats for humans, these treats should not be used simply as a source of nutrients, but as something that makes every day a little special. It’s still really important that your dog’s proper meals are healthy and suit your dog. For example you might need to adjust its food depending on it’s age, health and so on. Can a dog really be vegan? The answer depends on who you ask. Many vegans would say that of course they can, whereas most vets would advise against it. The thing is that it is possible for a dog to be vegan, but it’s really difficult to do it right, because it can easily happen that the dog doesn’t get enough protein and vitamins that it would usually get through meat. A dog needs to eat at least 25 grams of protein per 1000 calories and it will be difficult to get a natural balance certain amino acids like taurine and L-carnitine, as well as B vitamins, calcium, phosphorus and iron, that they would usually get through eating meat. Unlike cats, that actually have been known to die from a vegan diet, dogs can be vegan, but the question is if it’s good for them. If you try out a vegan diet for your dog, you need to be aware that it might not work, and you might have to start giving it meat again. Some animals are made to eat meat, and it’s unnatural for them to do otherwise. If you yourself are vegan because you care about animals, make sure that you care enough about your own pets to feed them meat if they need it. If you feel terrible about buying regular cheap dog foods from the shop, look into other solutions, it might take a bit more work but it can be worth it. If you on the other hand are vegan for health reasons, realize that our four-legged friends are carnivores for health reasons! So if everything points to that you shouldn’t give your dog a completely vegan diet unless you think it is absolutely necessary, why would you want to buy vegan dog treats? Remember that the ingredients of vegan treats not only are edible for dogs, but even healthy. The thing is that they can’t only eat them, but they’re a good supplement. Since treats aren’t necessary for the dog to survive some people might feel like it’s unnecessary for them to contain meat. Another reason to get vegan dog treats that are so pure that even human can eat them is if you have small children that might find a treat on the floor that your dog has missed. Sure, the kid could choke on it, so the best thing would be for it never to find any stray treats, but at least if the child manages to swallow it, it hasn’t eaten any disgusting meat dry dog food. One question you might have about vegan dog food is: is it healthy for your dog? Our conclusion after answering the question if a dog can be vegan is that sure, vegan dog food can absolutely be healthy for your dog, the only problem is that it might not be enough for it. It’s just like us humans, we need a versatile diet in order to have good health, and for dogs a versatile diet most often needs to include meat. It is possible to just feed a dog vegan food, but it takes a lot of either luck or hard work to make sure that it thrives from it. So the question if vegan dog food is healthy is kind of complicated to answer. But if we would change it and instead ask if vegan food is unhealthy the answer would be no, vegan dog food is not unhealthy. But the thing is that just like for humans, who can’t eat just one type of healthy food, dogs might need meat too in order to have good health. 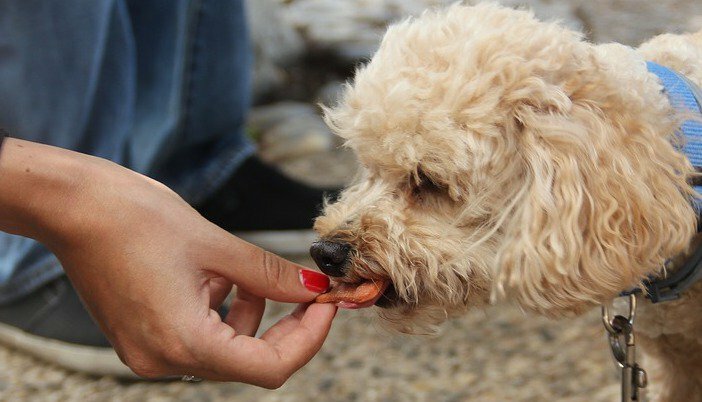 Are you still hesitant about which treats you should buy for your dog? 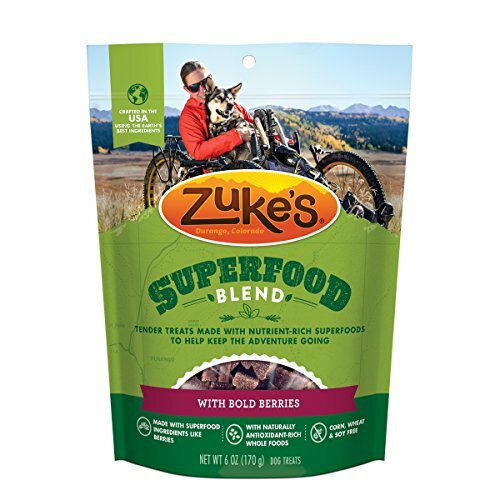 Only your dog can answer which dog treats that are the best, but if we had to select a favorite we would recommend Zuke’s Superfood Blend treats, mostly because we love eating so-called superfoods ourselves, so it make sense to transfer that onto our furry friends as well. It might be a good idea to buy two or three bags of different treats and see what your dog prefers before you decide which one you should buy on a regular basis. We think it would be really fun with a blind taste test, maybe hide treats in toilet rolls or little boxes and see which one your dog is most desperate to get out! 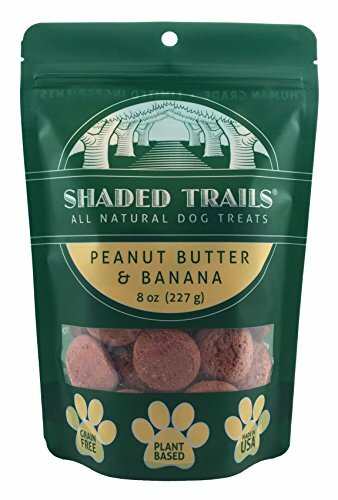 Shaded Trails dog treats are probably the biggest in this list and would work well for big dogs that need something to chew and that feels worth the effort of doing the tricks you ask them to do. Dogs are able to eat a vegan diet if you do it right, but cats could actually die from it! Make sure that you know what all the ingredients in your dog treats are, that way you can be confident that you’re only giving good stuff to your dog. Read more about how to evaluate a pet food ingredients list here.